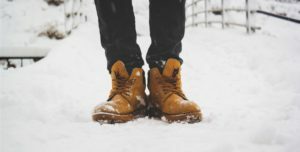 Whether you’re trudging through snow in below-zero temperatures or contending with damp, muddy conditions, it’s important to take care of your feet all winter long. After all, you want your feet to be healthy when spring finally arrives! • Waterproof boots are a must-have! My favorite for the season are Sorel (Sorel.com). Inside the boots, you should wear moisture-wicking socks that help ensure you stay warm and dry in bitter temperatures. Some of the best moisture-wicking socks include ROCKAY Accelerate, Balega Hidden Dry, Thoro Experia, and Saucony Performance. Damp, sweaty feet can chill more easily and are prone to bacterial infections, so keep them dry! • Winter is skiing, snowboarding, and ice skating season. It’s imperative that your ski/snowboard boots and skates fit properly in an effort to prevent blisters, chafing, and foot and ankle injuries. You should be able to wiggle your toes in your boots and skates, but the boots and skates should immobilize the heel, instep, and ball of your foot. If desired, you can use orthoses inside the boots and skates to help provide arch support. • For all you avid runners out there, you don’t need to let the cold stop you (let’s be honest, we all know it won’t anyway)! You can compensate for icy conditions by changing your foot strike pattern and shortening your stride to help maintain stability. It’s especially necessary to remember to stretch before you begin to run. Cold weather can make you less flexible, so it’s important to warm up your muscles before running. • If you are a diabetic with peripheral neuropathy, you may experience loss of sensation or numbness in your feet. In this case, it’s crucial that you keep your feet away from heaters. You can easily burn your skin without even knowing. • Mild cases of frostbite can be treated with GRADUAL warming. If you suspect that your frostbite is more severe, contact your podiatrist immediately. • Lastly, winter is the time to get your feet ready for spring and summer. This means keeping the polish off to not only allow stains to grow out but to allow your toenails to breathe. If you have nail fungus, winter is the time to treat it! Speak with your podiatrist about anti-fungal solutions. Better yet, consider laser treatment, which is the most effective way to rid your toenails of unsightliness. Happy Winter. Stay warm and cozy.